When you get it you get it and when you don't, you don't-- as any lover of Gary Larson's The Far Side knows! 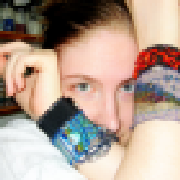 This clever little tongue-in-cheek bracelet proclaims the wearer's geekery, but only fellow geeks will notice! The tag, custom made for this piece by metal artist anandi, is aluminum and measures roughly 1 inch by 1/2 inch (2.7x1.7cm). 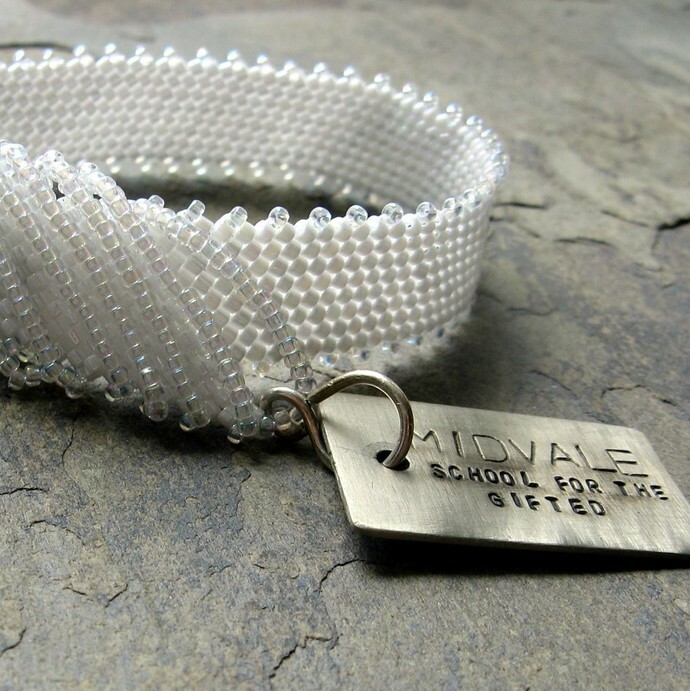 It reads Midvale School for the Gifted and has anandi's signature atom stamped on the back side. I wove a ribbon of peyote on the diagonal-- a bit off kilter-- in two subtle and shimmery shades of white glass Delicas and detailed it with clear rainbow-finished beads. The piece snaps closed, invisibly. 1/2 wide (1.2cm), the bracelet will fit a wrist size up to 6 1/2 inches (16.5cm). It's stitched with FireLine. This would make a super graduation gift for the right girl!